Do you have photos, historical accounts or other items pertaining to the Hastings area? Would you like to share this historical information with the world? LakesnWoods.com would like to publish your Hastings photos (current or historical) or historical accounts on this website. Original materials can be returned and your privacy will be respected. Hastings is a city in Dakota and Washington counties in the state of Minnesota, near the confluence of the Mississippi and St. Croix Rivers. 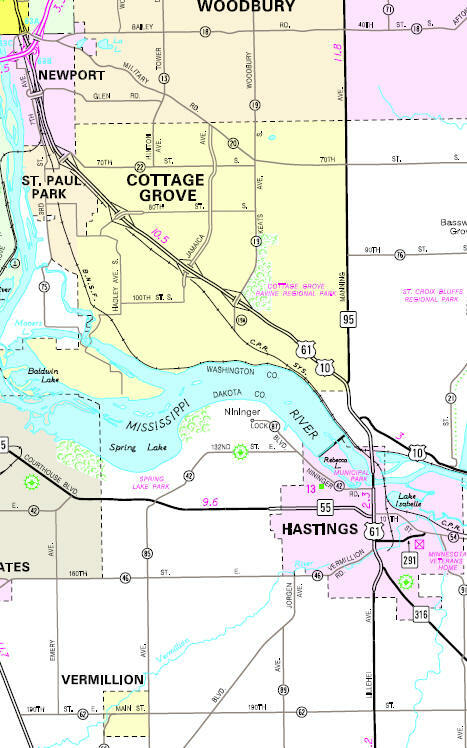 The bulk of Hastings is in Dakota County; only a small part of the city extends into Washington County. It is the county seat of Dakota County. U.S. Route 61 and Minnesota State Highways 55 and 316 are three of the main arterial routes in the city. According to the United States Census Bureau, the city has a total area of 11.0 square miles (28.5 km² ),of which, 10.1 square miles (26.2 km²) of it is land and 0.9 square miles (2.3 km²) of it (7.92%) is water. The elevation is 725 ft (222 m) above sea level. In the city the population was spread out with 27.3% under the age of 18, 8.9% from 18 to 24, 30.6% from 25 to 44, 21.5% from 45 to 64, and 11.7% who were 65 years of age or older. The median age was 35 years. For every 100 females there were 99.8 males. For every 100 females age 18 and over, there were 97.7 males. The median income for a household in the city was $53,145, and the median income for a family was $61,093. Males had a median income of $41,267 versus $27,973 for females. The per capita income for the city was $22,075. About 2.1% of families and 4.9% of the population were below the poverty line, including 3.4% of those under age 18 and 9.8% of those age 65 or over. HASTINGS, the county seat, platted as a village in 1853 and incorporated as a city March 7, 1857, was named in drawing lots by its several proprietors, this second name of Henry Hastings Sibley, later governor and general, having been the winner's preference. "Judge Solomon Sibley, of Detroit, Mich., studied law in Massachusetts with Judge Hastings, whom he greatly admired, and gave this name to his son." The post office was established in 1854, and the village became a city with Washington County following the annexing of 262 acres from that county at the end of the Mississippi River bridge in 1905; other acreage was annexed from Nininger and Marshan Townships. The city was the site of the spiral bridge over the Mississippi River, which was dismantled in 1951. The Hastings Business Directory is Coming Soon!